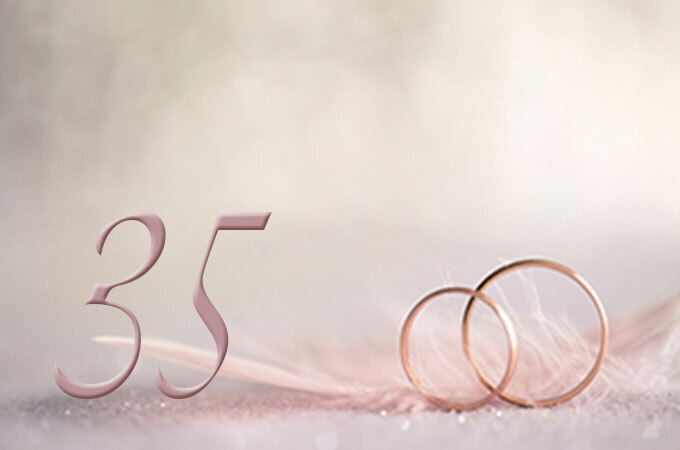 What is the 35th wedding anniversary name & symbol, called? Many congratulations on reaching your 35th Wedding Anniversary or your Coral Anniversary. A time to celebrate a shared life and all it can present. Celebrating your 35th wedding anniversary is a real achievement. Throughout history and various cultures associated coral with sacred and magical properties. As recently as the 20th century, coral was worn to protect against sterility. What is 35th wedding anniversary gift for Him, Her & Parents? While coral jewellery is a popular choice, other coral or marine themed gifts, such as a coral coloured accessories, a seafood dinner or a visit to a coral reef, make excellent 35th wedding anniversary choices. For a 35th wedding anniversary, the traditional gift is coral, and the modern gift is jade. This means that a 35th wedding anniversary gift should involve coral or jade in some part if an individual wishes to follow tradition. Of course, some people may choose to not follow these traditions when choosing a gift for their spouse or another couple celebrating their 35th wedding anniversary. Jewellery is a popular wedding anniversary gift, and both coral, jade and emeralds can be made into jewellery. Coral and Emeralds can make an exotic statement, while jade has a smoother look. If real coral, jade and emerald jewellery is not an option, one can buy coloured jewellery. This way, the gift can be in any style desired. Men can enjoy gifts made of coral, jade and emeralds. A set of jade cuff links or a coral-coloured lapel pin or maybe an emerald studded tie pin would work nicely. If the couple is not interested in jewellery, a trip to an exotic location to visit coral reefs can be a fitting and luxurious gift. On a smaller scale, a trip to a local aquarium or even to a place you once visited in the early years of marriage, maybe that seaside town you both enjoyed. What can I buy my husband for our 35th wedding anniversary? Witty themed T Shirt (themed around the 35th anniversary of course). Coral or Jade coloured clothing (Keep the colours subtle, golfers wear these colours). Coral stone figurines (dolphin or sea themed). Newspaper from the date you got married. Sports or hobby related gifts (golfer, fisherman, spectator etc). What should I buy my wife on our 35th wedding anniversary? Coral custom jewellery (makes a great and inexpensive gift). Coral or Jade coloured jewellery box. Coral or Jade coloured clothing and accessories. Coral coloured bouquet of flowers. Location visit (return to your honeymoon location and relive the passion). Cocktail mixing and spirits master class. City break (plan a tour of Europe’s beautiful cities). Holiday, diving to see coral reefs. Diving lessons (get ready for that dive holiday experience). 70’s – 80’s weekend music festival (disco). Celebration Party at home or a local restaurant (theme the party with pearl colour and photos from over the years). Celebrate a 35th wedding anniversary adding more great memories, you’ve earned it. It’s our 35th coral anniversary on 25th July. Over the years we’ve celebrated in Paris or The south of France. Not this year though, for the obvious reasons of travelling there. I already have a Gucci coral bracelet bought on our pearl anniversary. So for us this year it’s a card and a nice meal out locally somewhere.